SAM DJ - SAM DJ - Professional mobile DJ software solution. Dual decks, automatic crossfading, beat matching, karaoke, gap killer, large media library support, drag & drop management, album cover support and much more! The best sound for the best party ever! Leawo Tunes Cleaner for Mac - Leawo Tunes Cleaner for Mac is an intelligent smart iTunes cleanup tool to seamlessly organize and repair your iTunes music library within few simple and easy clicks. It could apply completeness of iTunes music files to your iTunes in one click. 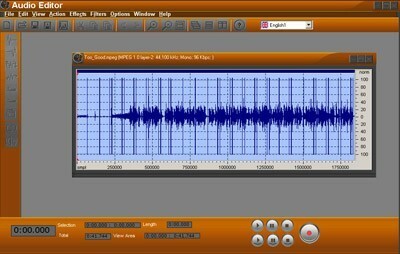 RecordPad Professional Edition - RecordPad Professional Edition is a quick and easy audio recording software. With this program you can record voice, sound, music, or any other type of audio. RecordPad Pro is ideal for recording audio for digital presentations. AnyMP4 Video Converter - AnyMP4 Video Converter is able to help users convert any video/audio to any other popular video/audio formats on Mac with fastest speed, even 4K videos. And you can enhance/ edit/ rotate video before converting. Voxal Plus Edition - Voxal Plus Edition is a state of the art voice changer software to edit and add effects to voice recordings. You can also change your voice in real time as you talk into the microphone on your Windows PC. Voxal Voice Changer Software Free - Voxal is free voice changer software for Windows designed to enhance any game or application that uses a microphone. Change your voice and add effects such as pitch or echo in real-time as you talk into the microphone on your Windows PC. Zulu DJ Software Free - Zulu is a free professional DJ mixing software for Windows PCs. Mix and broadcast live music, audio and mp3s. Allow the software to scan for the BPM of each track and sync the two turntables for a seamless crossover. MacX Free iMovie Video Converter - MacX Free iMovie Video Converter is a professional free iMovie video converter for Mac that can convert any SD and HD videos to iMovie accepted video formats like MOV, MP4, MPEG, etc for importing to iMovie, while keeping the original video quality.